Caitlin Gerard and Elvis Nolasco in American Crime, on ABC. The current TV schedule is clogged with shows that use geopolitical and corporate paranoia, apocalyptic fantasies, and the never-ending battle between those guided by faith and ideology and the members of the reality-based community as the grist for sprawling murder-mystery conspiracy thrillers, such as American Odyssey, Dig, Fortitude, and whatever is taking up space right this minute on SyFy. American Crime, which was created by 12 Years a Slave screenwriter John Ridley for ABC, is vastly different. It’s set in a tawdry, exhausted, post-crash America, with a cast of characters who are in the process of being ground up not just by The System, but by life itself. In the unglamorous setting of Modesto, California, a young man named Matt Skokie has been murdered; his wife, Gwen (Kira Pozehi), has been badly beaten and spends the first few episodes in a coma. In a TV landscape where the heroes are searching for answers or stumbling across clues that unlock mysteries that will dictate the fate of whole civilizations, American Crime is full of people who are doing their damnedest to keep the truth hidden, even from themselves. Matt’s mother, Barb (Felicity Huffman), is a pathological racist who wants everyone to believe that her son was a war hero who enlisted in the military so he could fight al-Qaeda, even though he was actually a drug addict who she wanted to see shipped overseas so she wouldn’t have to deal with what a messy, flesh-and-blood disappointment he really was. (Barb is the kind of self-righteous bigot who can’t listen to a sympathetic supporter tell her about her own tragic loss without interrupting to ask of a murderer, “Was he black?” She’s such a nightmare that Timothy Hutton, who plays her recovering alcoholic, deadbeat ex-husband, comes across as a much more sympathetic figure just because he’s fairly quiet.) Alonzo Guttierrez (Benito Martinez), the father of a teenager (Johnny Ortiz) the police tie to the murder, is an honest striver who urges his son to come clean in the interrogation room instead of asking for a lawyer; when his son is hustled off to a holding cell, Alonzo has to come to terms with his own naïveté about law enforcement and cops who see an angry young Latino without major financial resources as low-hanging fruit. The characters who do show an interest in learning more about what’s been going on around them come to regret it, like Gwen’s father (W. Earl Brown), who pressures a cop to let him read a report detailing his daughter’s extramarital promiscuity. He’s so repulsed that he begins to talk about his daughter as if it would be better if she never woke up; when, miraculously, she does, he can’t look her in the eye. 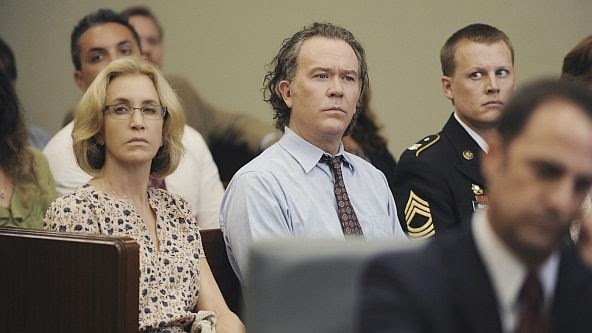 Felicity Huffman and Timothy Hutton in American Crime. The standout performance comes from Elvis Nolasco as a black druggie caught in the criminal justice system who accepts help from his sister (Regina King) and her church group, even though it means tolerating her disapproval of his white druggie girlfriend (Caitlin Gerard). When Nolasco’s character is bailed out, after having spent enough time behind bars to get clean, and reconnects with the lover he adores but who is also his sure-fire ticket back to his destructive old habits, American Crime has some of the complicated emotions of The Wire, especially in the storyline involving Andre Royo’s Bubbles. The Wire remains television’s great example of how to depict the pressures and limits that a political-bureaucratic system puts on people who are trying to do some good, and the way that people’s urban surroundings and economic situations shape their lives, without ever reducing its characters to victims trapped in their slots. And when it showed you that one of its characters was really, hopelessly trapped, like Larry Gilliard, Jr.’s D’Angelo Barksdale, the show was mainly interested in suggesting the possibilities that were going to waste, and about to be lost forever. The characters on American Crime are mostly just the sum of their limitations, the products of their societal programming and the things they’ve embraced—like Huffman’s racism, or Regina King’s religion—to help them make sense of a world they’re not strong or courageous enough to perceive in all its complexity. For all its ambition, it may beat anything on network TV right now for contempt for its own characters, and for its audience. – Phil Dyess-Nugent is a freelance writer living in Texas. He has contributed to The A.V. Club, HitFlix, Nerve, HiLobrow, and the New Orleans Times-Picayune, among other publications.